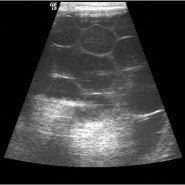 Introduction: Though imaging findings of hydatid cyst involving liver, lung and brain have commonly described, description of musculo-skeletal hydatidosis is rare. It is usually a “clinical dilemma” as the lesion often clinically mimics a neoplasm (more so a malignancy) and serological tests for hydatidosis are often negative. Case Report: We describe a case of unusually giant hydatidosis of left lower limb involving various muscles as well left hemi-pelvis with extremely unusual extension into pelvis. Ultrasosnography and CT scans suggested Hydatidosis but serological tests were negative. FNAC confirmed the diagnosis and en bloc resection was done. Follow up medical management was continued with no recurrence at 6 months.